An article in Wednesday's St, Petersburg Times pictures a 'coin' found by a local metal detectorist. Does it look familiar to anyone? It is a token or medal? Or just a piece of junk? -Editor. The other recent find is even more befuddling and exciting. 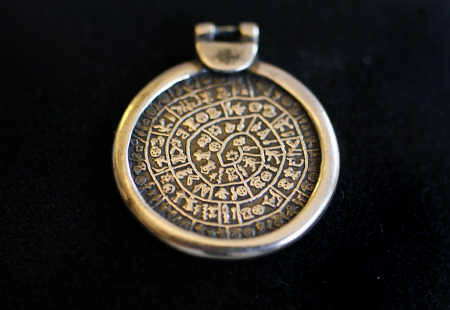 It is an old coin with what seems to be hieroglyphics on both sides. But coin experts are having trouble dating it. The coin could be thousands of years old. Someone within the past century encased the coin's sides with silver, so it could be worn as a necklace � which might be how it ended up lost in the ocean.